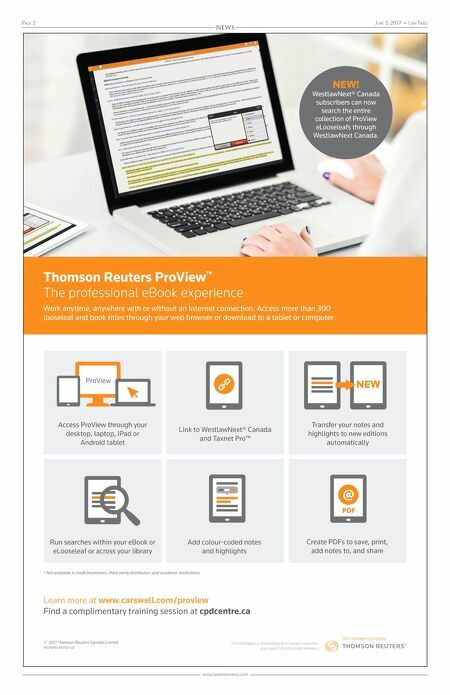 Page 2 June 5, 2017 • Law Times www.lawtimesnews.com NEWS Thomson Reuters ProView ™ The professional eBook experience Work anytime, anywhere with or without an Internet connection. Access more than 300 looseleaf and book titles through your web browser or download to a tablet or computer. Learn more at www.carswell.com/proview Find a complimentary training session at cpdcentre.ca ProView NEW @ PDF Access ProView through your desktop, laptop, iPad or Android tablet Run searches within your eBook or eLooseleaf or across your library Add colour-coded notes and highlights Link to WestlawNext® Canada and Taxnet Pro™ Transfer your notes and highlights to new editions automatically Create PDFs to save, print, add notes to, and share * Not available to trade bookstores, third-party distributors and academic institutions. © 2017 Thomson Reuters Canada Limited 00242PD-A87102-CE NEW! 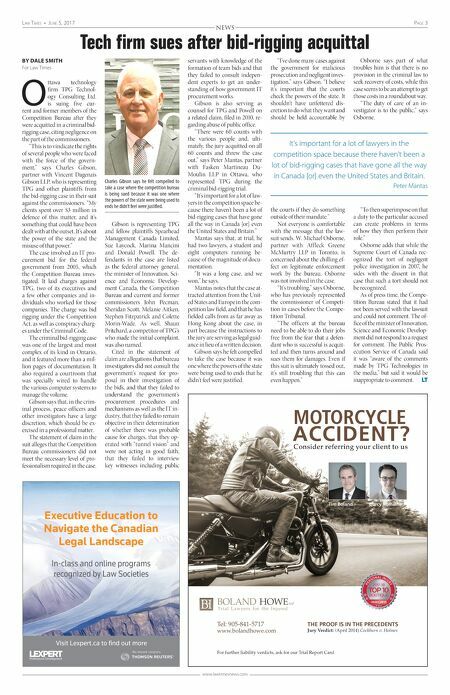 WestlawNext® Canada subscribers can now search the entire collection of ProView eLooseleafs through WestlawNext Canada.